New ListingBatman Incorporated (2010 and 2012) #1-8(2010) and 0-13(2012). 22 Comics!!! 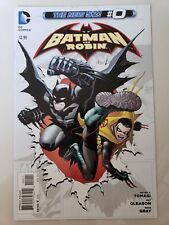 Batman #0 (2012, DC) New 52 Scott Snyder Greg Capullo Red Hood Gang SHIPS FREE! BATMAN THE DARK KNIGHT #0 (2012) DC 52 COMICS INCREDIBLE DAVID FINCH COVER! Batman The Dark Knight # 0 (DC New 52, 2012, VF / NM) Combined Shipping!